The reading and burning speed of DVD±R is stocked at 16X for a long time, but the bottleneck of technology had been broken through in 2006. 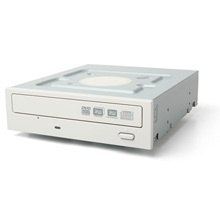 The brand new DSW1812P form AOpen Inc. push up the speed to 18X DVD±R burning and 12X DVD-RAM read and writes; this is a new limit of optical disk drive. DSW1812P is a complete DVD/CD burning solution that allows you to access all optical disc types in remarkable speed. Aside from 18X DVD±R, 12X DVD-RAM burning, it provides 8X DVD±R DL (Double/Dual Layer), 8X DVD+RW, 6X DVD-RW, 48X CD-R and 32X CD-RW. To ensure the best stable and faster burning process, DSW1812P built in 2 MB memory for buffering. The burning time will dramatically decreased when you backing-up data, creating family movie, or music CD. DSW1812P is very suitable for personal and working purposes because of it built-in many core technologies developed by AOpen. They are: Auto Balance System (ABS) for decreasing the vibration of disc cause by high speed burning and improving burning quality; Noise-control System (NCS) for dropping noise by unique tray design; and Running Optimum Power Control (ROPC) for high precession of LASER power control. With DVD±R DL media, you can safety storage up to 8.5 GB data within 20 minutes. The AOpen DSW1812P equips the special silent technology that can help to remain quiet working environment while burning. You can burn all media types such as DVD-Video, Audio DVD, data DVD, VCD, music CD, and photo CD. Therefore, you will have a delightful burning experience with it.